Size: 30x40cm / 12x16 inch. All canvas wall art are wrapped on frames, bracket mounted, protected by plastic bags and put in carton box finally. Drive a nail, aim the bracket and hang. P.S. : The bracket has sawtooth for balance or tilt adjustment. Our canvas prints can also be custom-made for your own size, photos or pictures. Welcome to contact us by "Sold by Piy Painting" then "Ask a question!" 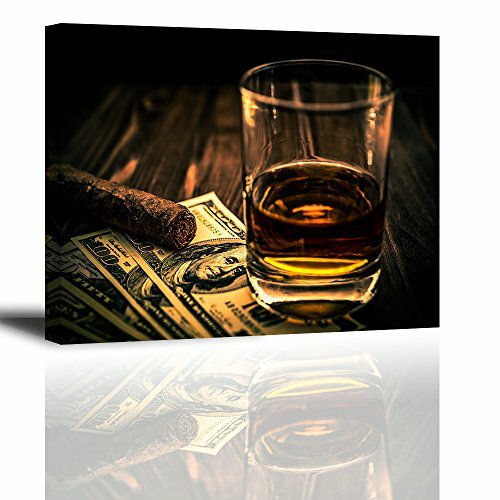 1: Beautiful wine & cigar canvas wall art printed and framed by PIY Painting. The artist-grade canvas has strong sense of texture and full of artistic touch, reflects your noble temperament and taste. This canvas picture dimensions: 12"x16"x 1 piece = 30x40cm x 1 piece, close to A3 size.